I took a break from reading Knitting Without Tears, for the Canary Knits Knitting Book Read-a-Long, until I put at least one thing I learned into practice. That thing was learning to knit continental. 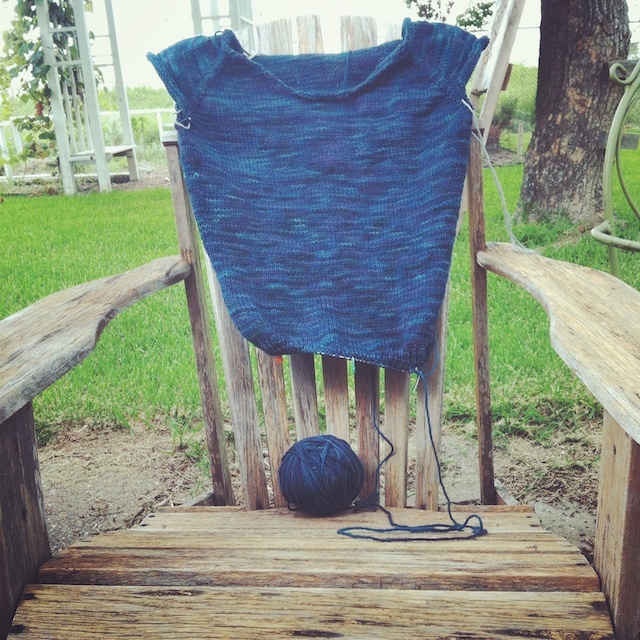 The Ease pullover is my experimental continental sweater. Thank goodness it's worsted and not lace weight. Continental is Elizabeth's knitting method of choice and seems to be a favorite of people who get things made quickly. I was hoping it would help me get control of my crazy, loose gauge and maybe give me a bit more speed. 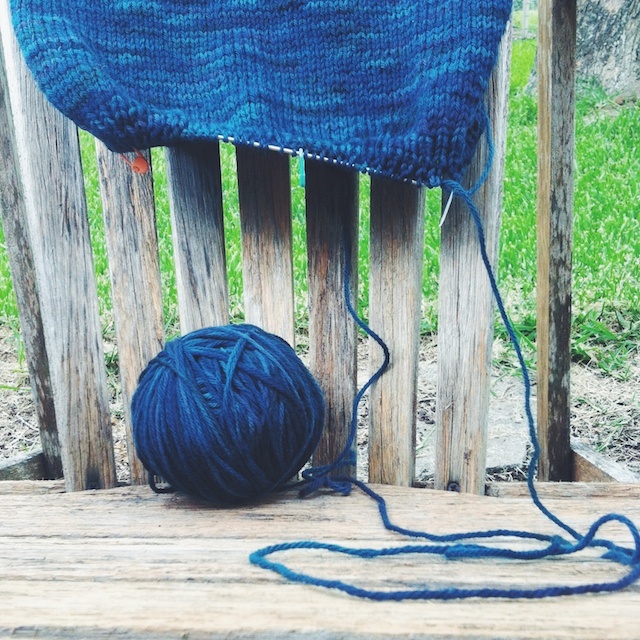 In her book, Elizabeth says she a slowish knitter, making about 50 stitches a minute. I was curious where I fell, in terms of knitting speed, so I timed myself, too. I'm super slow, apparently, getting maybe 34 stitches per minute. I did better when I quit looking at the work and watched tv, which makes me think overthinking my speed trips me up. You know, like when you realize someone is watching you eat and suddenly you can't get your fork into your mouth correctly? So continental is where the yarn is on the left side of me and runs over my left forefinger, which is also holding my right needle in place. 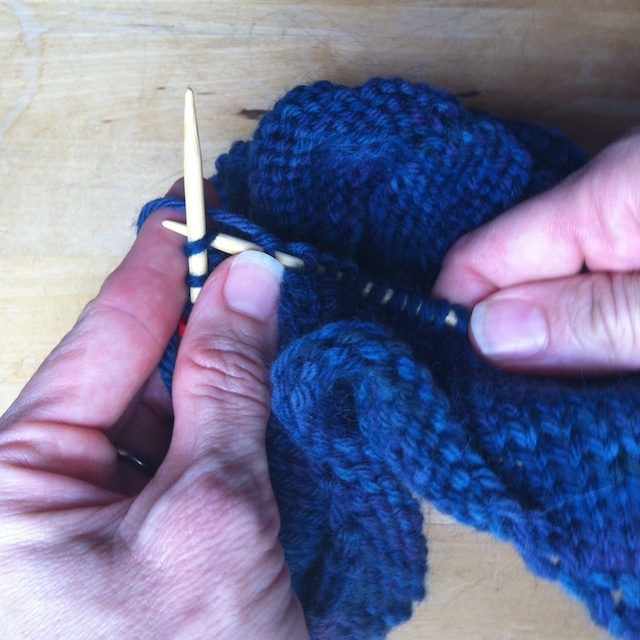 I then quickly bring the tip of the right needle under the yarn and to the left to pull it through the stitch on the left needle in one hooking motion. My hands never leave the needles and it really does move faster than knitting in English style. With English, below, I let my right hand carry the yarn and throw it over the right needle from back to front. If you'll notice in the photo below, my right hand has to leave the right needle for a second to throw the yarn. That's part of the speed problem and I think my fingers and wrist get overworked and compensate by ever loosening their tension, hence my loose gauge. When knitting continental, I can easily knit too tightly without trying. Guys, I'm using a size 5 needle in a worsted weight sweater! That never happens anymore. I feel like real people again! If I have a hard time continuing in continental, sbnyc (ravelry name) in the SSKAL group recommended flicking. It's a bit of a combo style. The right hand carries the yarn, but never leaves the needle to throw it. If I hadn't already decided to experiment with continental, I probably would have stuck with flicking. The real trick to continental is purling. I'm still doing that like I'm in rehab. I can't make my fingers do what I want them to do. And it's very, very slow. This isn't really problem on this sweater because it's mostly worked in the round, but on my Featherweight it's killing me. 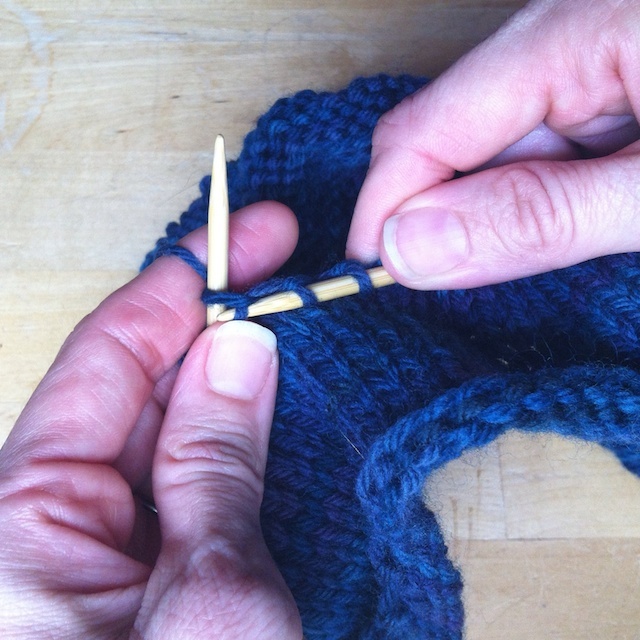 Then, as if on cue, Webs posted a video of this speed purl method that may be worth a try. I've been focusing on my Ease, so I haven't had a chance to really try it, but it looks promising. hummm I disagree with flicking being necessarily quicker. I'm a thrower and can knit at a pretty quick pace. I think it all depends on how much you move your hands around etc. I figured out what the best position for my hands and arms was with the least amount of movement and just kept practicing. sbnyc here! I was going to mention that Webs post -- I'm trying to pick up speed purling myself. Purling is the one thing that slows me down. I've never gauged how many stitches I knit in a minute. (I should track that.) Just keep up with the Continental -- I swear, you'll never regret it. But just focus on the knit stitch for now. Trying to do both (knit and purl) may cause your brain to explode. You're doing great so far! Imagine needing a size 8 needle for your worsted weights! Look at you go with those bigger needles! Bet that feels odd to hold. :) My best buddy is trying to switch to continental, and she's trying to talk me into switching too (mostly because I think she wants someone to compare notes/complain with). I've done it during colourwork projects and a few times for a lark in the past, but I haven't made the effort to go for more than a couple of rows. I like throwing - for now. Although it's funny - when I crochet, it's so natural to hold the yarn in my left hand. I don't know why it doesn't feel natural with knitting. Maybe when I'm done my Deco Daisies, I'll experiment with my knitting technique again. I should be used to holding the yarn left-handed again by then. I don't think you mentioned it, but are you finding yourself speeding up yet? Or do you need a bit more time to get the hang of it first? Looks like you're doing wonderfully with the continental! Nice, even tension. It's funny...I'm super loose with continental, usually going down one needle size or more on most patterns. Thanks for the speed purling link! Going to check that out. 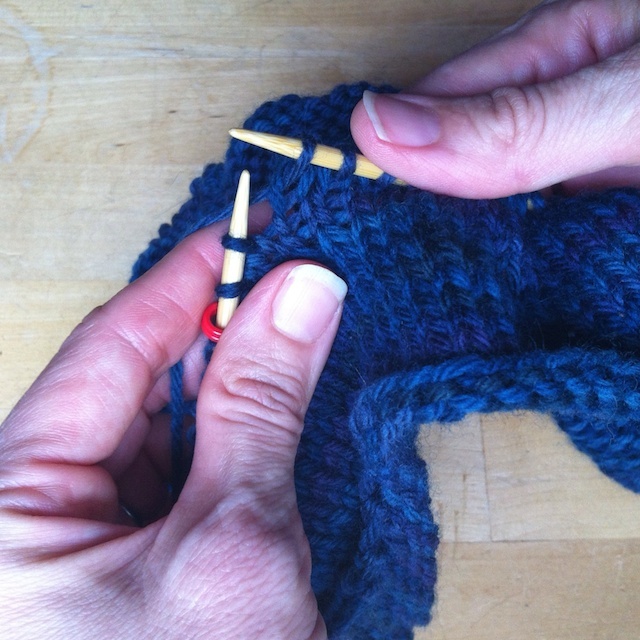 I do the "combination" knitting thing so that the continental purl is really easy. Then I just knit through the back loop on the way back. This works great, but not if you're doing lace with a lot of k2togs (because you have to take time to turn the stitches around). Anyway, I only use continental when knitting with 2 colors anyway, I just love my English method too much! I see what you mean. I can throw fairly quickly, but not with good control of my gauge. This method seems to have helped my issues, though, so I'm glad I tried it. Thanks for the encouragement, Marta! I decided to do all of a Ease this way, only now I'm at the 5 inches of ribbing and it's slow going. 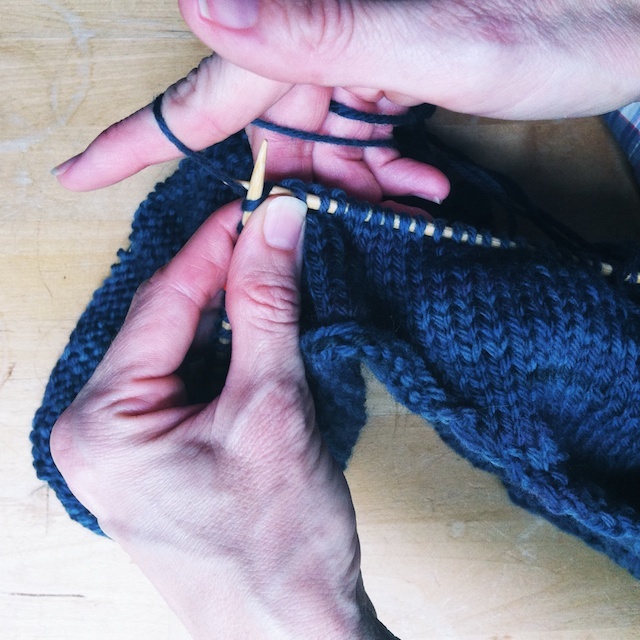 Someone in the SSKAL mentioned using my thumb to purl and do ribbing. I've tried but can't quite get the hang of it. I'm just moving my forefinger up and down and it's working okay. I do think I'm speeding up. I'm going at least as fast as when I knit English style with the knit stitch. My purling is less consistent and the 5 inches of ribbing on my Ease is agony. Not really, but I did enjoy setting it down for Holla Knits crochet. You know, I think that baby giftt I crocheted helped ease me into continental. I'm sure you'd catch on super fast, especially since you don't seem to have loose tension problems. Btw, your Deco Daisies is so pretty it's making me want to impulsively cast one on when I should be finishing other stuff. Thanks, Cassy. After all of the feedback I've received here and on Ravelry, I'm sure that metal Addis were part of my loose knitting problem, along with letting go of the right needle. Even on ease I'm still down a needle size or two, but size 5 feels like a jumbo needle to me. This interests me, Dayana. I think I'll try it on something not ribbing and see how it works. My Featherweight is proving tricky with all of the purling, so it would be a good way to practice. I let go of the right needle too, but I'm generally a tight knitter. I've been training myself to loosen up, and I've noticed a change in my speed as a result. A bit, anyways. The metal tips have been helping with both, I find. :) Funny how different we all are, eh? So I picked up Knitting Without Tears, entirely because of your comments on it (plus Knit Picks was having a book sale and I was just shy of the $50 I needed for the cheaper shipping - heh). I'm really enjoying it so far. I don't know much about Elizabeth Zimmermann, other than the general mutterings that she's some sort of knitting goddess or something, but wow I'll be looking more into her and her designs. I think I finally understand how to do kitchener! I'm really enjoying the well-written instructions - instead of a reliance on just photos (which is great, but I think I'll remember them better this way). Oh, to be a tight knitter!!! Oh cool! 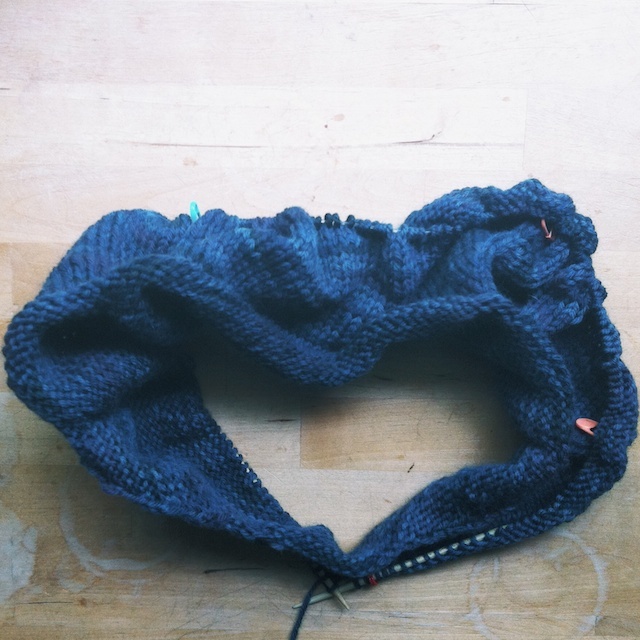 I still have a few more "recipes" to read, but I'm kind of waiting to try out her Seamless Yoke Sweater in September. I have all of my yarn ready, I just need to get through Ease and most of Featherweight. Pft!